What is a Hawaii Last Will and Testament? Hawaii Last Will and Testament: What Is It? In Hawaii, a Last Will and Testament is a document that a Testator (the person who passes down or distributes their assets once the pass away) creates to ensure that his or her assets are given to the proper people, and not seized by the state. Although these documents are a legal means of a Testator transferring or distributing his or her assets, it is not recognized by the state of Hawaii unless it is signed by two attesting witnesses and notarized by a Notary Public. 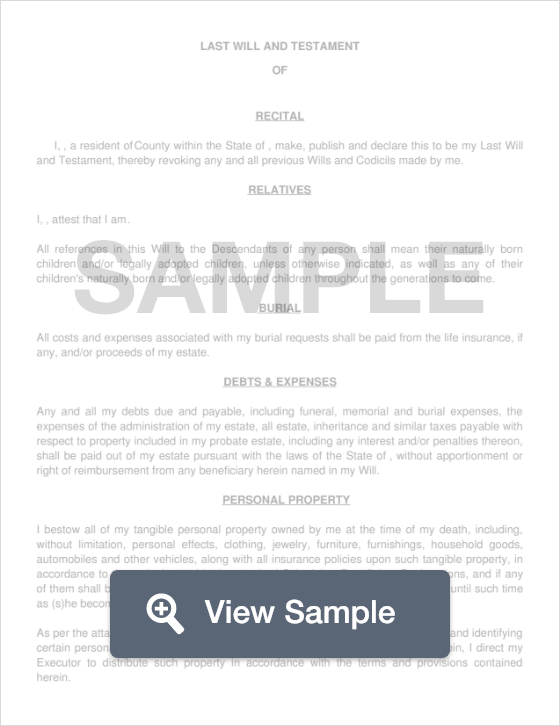 Last Will and Testament laws vary between states. Below are the defined laws for the state of Hawaii. Witnesses - According to § 560:2-202, the Will must be signed by two (2) witnesses. Step 1 - After opening your FormSwift template, input your name and your gender. Next, provide the name of your spouse (unless you are single). Step 5 - In this section, specify how much or what percentage you’d like to leave each child. Step 6 - Would you like to set up a trust for someone who is disabled, or perhaps for someone who has a mental illness and requires special care? Setting up a trust can prevent any interference with their ability to receive benefits like Supplemental Security and Medicaid. How old will children be when they begin receiving benefits? What percentage or what amount will they receive? How old will they be when the benefits come to an end? Step 8 - Is there a particular funeral home you would like your body taken to? If so, provide that information in this section. Step 9 - Do you have any specifics on the meal after your service? Additionally, if you wish to name an alternate Trustee or if there is someone you don’t want acting as the Trustee over your will, be sure to name them in this step as well. Be sure to have your witnesses sign the document, attesting that you have created this Will and are of sound mind doing so. Additionally, have your document notarized by a Notary Public.